It’s still not too late to sign up for one of our popular Spring college credit classes. These semester-long classes, beginning on January 21 and running through May 5, are by far the best value we have to offer. Escape from all the stress of the classroom or lab each week and enjoy learning on or in the water. While we offer sailing, surfing, stand up paddleboarding, and sea kayaking classes this upcoming spring, we also offer a variety of classes not beginning with the letter “S”, like wakeboarding, waterskiing, windsurfing and rowing. 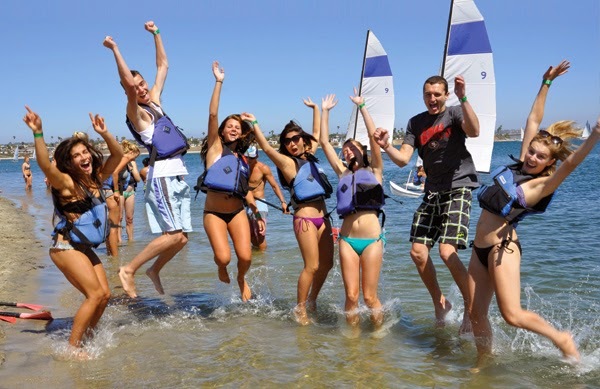 While SDSU and USD students can get college credit for taking these incredibly fun classes they are open to anyone looking to learn something new or have fun participating in watersports. The first class meetings for SDSU students meet on campus in Park Boulvard in the Conrad Prebys Aztec Student Union January 21-27, and USD students can attend the watersports credit class orientation on the USD campus on Tuesday, January 27, 1pm-2pm in Maher Hall 205. If you can't make those meetings or aren't a student then you can start class during the first class meetings at MBAC January 28-February 3. Priority registration is given to current SDSU/USD students. Registration in a class is not confirmed until you register and pay your lab fee with MBAC so be sure to select your class, register online, and reserve your spot soon as some of these classes will fill up quickly.